Joseph Bulova founded a wholesale jewelry business in 1875. He established the Bulova Watch Co. in Biel, Switzerland in 1885. 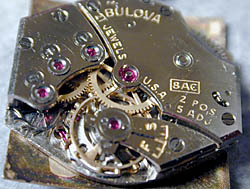 Bulova manufactured movements at its Swiss factory, and eventually they established distribution and manufacturing facilities in the United States. Large numbers of movements made in Switzerland were installed in U.S. made cases. Bulova movements were also installed in watches sold under other names, such as Bucherer. 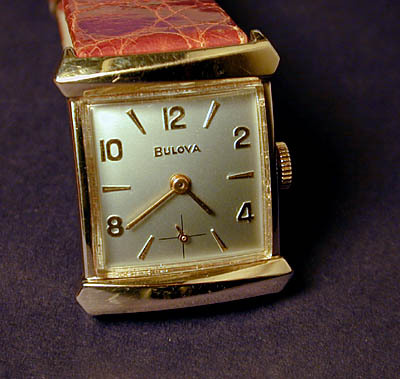 Bulova became a leader in the mass production of higher quality wristwatches. Bulova also produced pocket watches, though in more limited quantities. Bulova is probably most famous for its Accutron line of electric watches, introduced in 1960. Unlike current production watches, my vintages have no story of a long pursuit. They have always been impulse purchases. Such is the case with this little watch. I was checking out a site I visit regularly, one not known for vintage pieces, and this one caught my eye. I have always liked square dial watches. I also like asymmetric watches, and this Bulova has slightly asymmetric lugs. Finally, I’m always a sucker for yellow gold and a silver dial. This combination, plus the low price, lead to this purchase, about one year ago. I have not had the watch serviced since purchasing it, and the engraving inside the case back shows only one service. This watch strikes me as a bit of an anomaly. It dates from 1961 according to the stamp on the case back, yet stylistically this watch says 1940s, at least to me. It is small, only 28 mm long including the hidden lugs and 22 mm wide, not including the crown. The snap back case is 10K yellow gold filled (top and back). 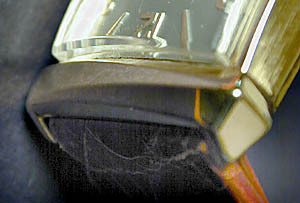 The case top appears to have been cast, while the snap back appears to have been stamped. The back is a folded piece of thin metal. The sides of the snap back are about 2 mm wide, and the back is hollow inside to hold the movement in place. Cosmetically, this watch looks good from a few feet away, but under a 4x loop, many scratches appear. Close examination also reveals the gold fill is worn through in a few spots, and it is flaking off in others along the edges on the back. None of this is visible on the wrist. The silver dial appears to be original, and it is in very good condition. The arabic numbers, hour markers and Bulova name are applied gold filled pieces. The hands are baton shaped. The crystal is glass, and it is in very good condition. 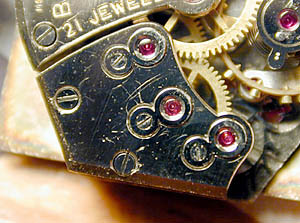 The crown appears original and is marked “Bulova”. I have the watch on a non-original thin (unpadded) large grain crocodile strap. This watch has a tonneau shaped manual winding 21 jewel movement with subsidiary seconds at 6. The movement is 20 mm long and 18 mm wide, and it is engraved “USA.” The plates and bridges have a brushed finish without decoration. Though they appear somewhat matte in the scans, the bridges actually have a fairly high shine. Anglage is apparent only on the outer edges of the bridges. All other bridge edges are ninety degrees, and though they have received some attention, the finish remains a bit rough. Though this is a relatively low cost, mass produced movement, it has some features many consider marks of a fine movement today. It has a screwed and jeweled balance, the gear train cap jewels are chatoned, and the screws are chamfered. The movement is engraved “2 pos 5 adj”. I sought ideas as to the meaning of this, and received conflicting opinions. One TimeZoner feels this refers to two positional adjustments, likely dial up and crown up, as well as heat, cold and isochronism, for a total of 5 adjustments. Another believes it means 5 positional adjustments plus temperature and isochronism. 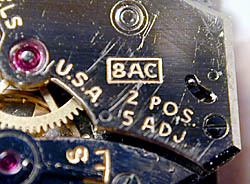 The small semi-circular slot next to the engraved “8AC” is the click. The small piece protruding through the slot allows the click to be manipulated so that mainspring tension may be quickly released for servicing. Overall, the movement appears to be in fairly good shape for a watch that is nearly 40 years old. This is especially true when you consider that the snap back does a very poor job of isolating the movement from dust and debris. A recent check against an atomic signal clock showed this watch is running about 35 seconds fast per day, which I consider acceptable for a mass produced watch of this age which I have not had serviced. This is a nice looking, reliable little watch that keeps decent time. My total investment is about $160, most of which is in the strap. With the snap back, this watch is easily opened, and I can enjoy looking at the movement without fear that I will ruin a very expensive watch. This watch demonstrates that vintages are a great way to enjoy the pleasures of mechanical watches and get some style for a small price. The background information on the Bulova Watch Co. is based on Automatic Wristwatches from Switzerland by Heinz Hemple, Shiffer Publishing Ltd. 1994, page 56, and the Complete Price Guide To Watches, No. 18, Cooksey Shugart, Tom Engle and Richard E. Gilbert (1998), page 463. Thanks to Paul Chambre who clued me in to Bulova’s date stamping system. 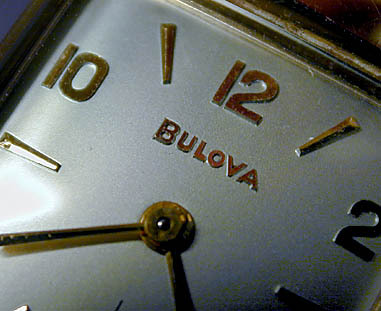 Around 1947, Bulova began stamped he backs of their watches with date codes. A = 1940s, L = 1950s, M = 1960s, N = 1970s. Paul is uncertain whether this date coding extended beyond the 1970s. My watch is stamped M1 on the back, for 1961. The movement is stamped M0, 1960.